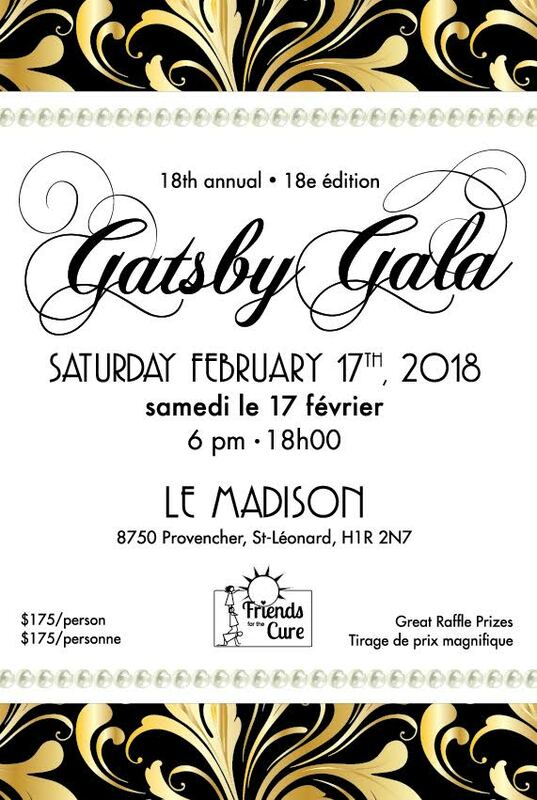 The 2018 “Friends for the Cure” fundraiser in aid of the Montreal General Hospital’s Peri-Operative Program, or POP, which provides crucial cancer care, was a smashing success! Held at one of Montreal’s most sought-after reception centers, Le Madison, the 18th annual charity event, dubbed the “Gatsby Gala”, enthusiastically welcomed nearly 900 guests, and some really dressed up for the occasion wearing everything from Gatsby-style headbands to pearls, and vintage dresses to head covers with feathers. Even the band, the highly-popular “Sophistoccasion”, got into it, performing its first set dressed in Gatsby garb. The suspended fairy tale lights and veils above dance floor as well the Gatsby sign at the entrance and beautifully-lit marquee gave the special evening a 1920’s feel. Le Madison, as always, came through with a superb international buffet to begin the evening, including oysters and caviar, as well as an exquisite served meal featuring lamb shank as the main course. But, the food didn’t end there. The midnight buffet showcased a number of different delights, including an ice cream station. The evening also featured a testimonial by POP patient Anastassia Khouri Frankman, who demonstrated remarkable courage by talking about what a huge difference POP has made in her life and that supporting it is truly vital. In the end, it was all about the money. An astounding $350,000 was raised for POP, as well as the Cedars Cancer Foundation. The “Friends for the Cure” wish to thank all supporters wholeheartedly for their precious contribution.